It's in 1995 when Donald P. Bellisario created the series "JAG" (Judge Advocate General), with David James Elliott and Catherine Bell (from the season 2, Tracey Needham having insured the feminine role side of the hero during the first season). The producers of this series are David Bellisario (elder son of Donald P. Bellisario) and Philip DeGuere Jr.
Donald P. Bellisario is not in his first masterstroke when he created the series JAG. Indeed, he is the happy creator and a project manager of series with success as "Magnum", " Code Quantum" or "Supercopter". Spread originally on NBC , the series is cancelled at the end of first season. CBS gets back the series and throws it to the following comeback with a new actress in the main feminine role, Catherine Bell. The series becomes then an immediate and solid success during 9 years which followed. This dramatic series, in the size of one episode a week of 42 minutes, tells the everyday life of lawyers asked to manage the internal judicial conflicts to the American navy. The first broadcasting in the United States takes place on September 23, 1995 on NBC. 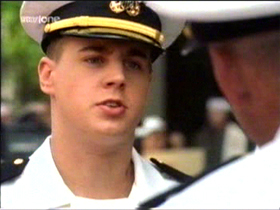 The current series of Sean, "NCIS", is the spin off of "JAG". It's during the double episode 20-21 in the season 8, that the characters of "NCIS" are presented (Sean not having yet joined the casting, he doesn't appear in the pilot). The hero, the Commander Harmon "Harm" Rabb, is the former fighter pilot of the American navy, obliged to abandon the active service further to a plane crash. It becomes lawyer and is connected with the JAG. J.A.G ., abbreviation of "Judge Advocate General", really exists. It's about a unit except for of Navy loaded with advising in justice and making respect the law within the military Department. From episode to episode, JAG investigates the world closed by the army, putting its cameras as well in Marine as in the Fleet Air Arm or the Land forces. Jealousies, rivalries, humiliations, secrets of alcôves, military espionage and diplomatic missions quarrel the favours of the scriptwriters recruited by Donald P. Bellisario. The first appearance of Sean in "JAG" takes place in the 3rd episode of the 4th season, entitled "Innocence", in the role of the Signboard Guitry. But it's during the season 6 that Sean arrives in a recurring role under Danny Walden's features, son of the doctor Sidney Walden. With this role, Sean interprets a manipulator young man. This role will appear in 5 episodes. "Innocence" (episode 3 season 4): Ichiro Higashimori walks on the beach when he hears a woman to shout at night. He leaves to his search and discovers his daughter, Jun, being assaulted by a stranger. The aggressor flees, but he loses in his running a base-ball cap. "Florida Straits" (episode 3 season 6): The captain Berroa is on his boat, US DACE, with the major William ' Willy ' Crozier, and the rest of his crew. They navigate the Caribbean Sea, off the coast of Cuba, in American territorial waters. While they arrive in a zone where float numerous fragments, they perceive a person in distress. Although these floating materials are in Cuban territorial waters, they decide to venture there, to carry help to the castaway. While 'Dace' penetrates into the Cuban space, a Cuban frigate tracks down it, and chases after it. On returning to Washington D.C., the major Harmon 'Harm' Rabb confides to Renée Peterson, that his half brother Sergei already disappeared since quite a lot of time. Renée, as for her, complains about absences repeated by Harmon. Suddenly, their evening is interrupted by the arrival of the admiral Chegwidden, which asks 'Harm' to collect his affairs to go in the Carribbean islands, in the big despair of Renée. "Flight Risk" (episode 4 season 6): To escape a storm, a F-14, with in his edge the lieutenant commander Mike Urquiza, and the lieutenant JG Jeff Berke, is obliged to land as quickly as possible. Both men are welcomed by the lieutenant commander Bob Holtsford, who welcomes them and to whom they present then their modernized plane. Urquiza and Berke are tired, but decide all the same to leave the base to go to destination. Some minutes later, while Holtsford speaks to one of his mechanics, Tim Cartwright, both men hear a deafening noise. They rush outside and perceive the plane of Urquiza and Berke in flames. To headquarters, lieutenant-colonel Sarah 'Mac' Mackenzie arrives late at a meeting dedicated exactly to this accident. The major Harmon 'Harm' Rabb Jr and the admiral A.J. Chegwidden is already present. While she settles down, Mic Brumby enters by surprise and the meeting begins. "Misty James/JAG TV" (episode 5 season 6): In Virginia, a couple by car stops on a bridge or a woman seems to wait for somebody. They know. The man names Andy. In fact both women fight for this man. The one is his wife (Susan Kingsley) and other his mistress (Misty James). During the fight, Misty falls on the ground... dead woman. "The Princess and the Petty Officer" (episode 6 season 6): In an housing of a naval base of Norfolk, in Virginia, the Leading seaman Elling, and his wife Fanny are arrested by federal agents. Certain Al Mutawaf addresses then Fanny, who is in fact a Princess of blood, and explains her that he received the order of His Royal Highness Al Khair, to return her at home. To the headquarters of the JAG, the admiral A.J. Chegwidden reports the events to the major Harmon 'Harm' Rabb Jr. He explains him that both young people met when Elling was allocated to Al Khair. Elling was repatriated in the United States, obtained false identity cards for Fanny, and introduced her on the American territory. Both young people got married a short time later. Furious, Fanny's family wants to get back the young lady. 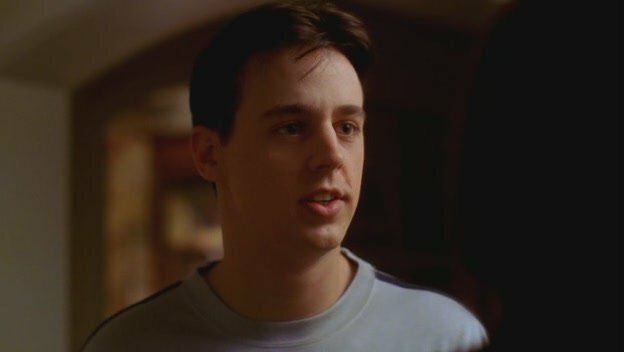 "Past Tense" (episode 21 season 6): The lieutenant Jordan Parker, the former girlfriend of Harmon Rabb, is found murdered. In the grip of intense feelings, the lieutenant is in charge of the inquiry, while he is also on the list of the suspects. Many photos of Sean extracted from these episodes. Here are some ones.